Financial institutions are dealing with the triple challenge of digital transformation, cyber security and regulations. They are constantly seeking to better serve their customers and establish a competitive edge through new technology innovations. But all too often, they fall behind on delivering these digital initiatives into production. Why does this happen? Network security operations teams are hampered by manual, slow and error-prone security change-management processes and the ever-increasing demands of industry regulations. 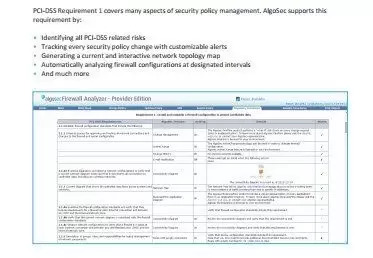 Often requiring days, or even weeks, to process a single change across their complex network environment, security teams are deluged with hundreds of changes each month, hindering time-to-market. Security teams fight hard to create and maintain a clean and optimized network security policy that reduces the attack surface. But the frequent errors that arise from manual processes put the institution at cyber risk, opening security gaps that attract unwanted elements. Errors also introduce regulation-compliance gaps. Financial institutions find themselves struggling with the next audit instead of passing with flying colors. 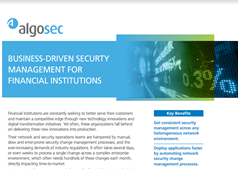 AlgoSec’s unique, business-driven approach to security management enables financial institutions to align security policy management with their business initiatives and processes, making them more agile, more secure and more compliant all the time. Financial institutions face two major network security related challenges while working to serve their customers: the constant demand to improve in order to successfully compete in the market and regulatory compliance. Yet, when it comes to security, the InfoSec team often uses slow, manual (and error prone) processes to make the necessary network security changes - thereby delaying the release of a new competitive application or feature to market. 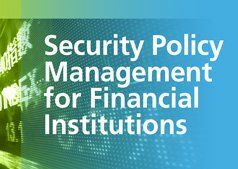 To overcome these challenges, financial institutions must implement a network security policy management solution which will: · Process the frequent security policy change requests automatically, with zero touch · Simplify and automate regulatory compliance management · Document all changes, providing a full audit trail Want to find out more? 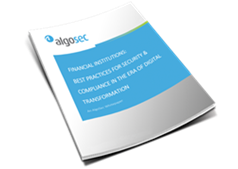 Download our whitepaper: Financial Institutions: Best Practices for Security and Compliance in the Era of Transformation It's time to discover how automation can help transform your InfoSec team from business inhibitor to business enabler. 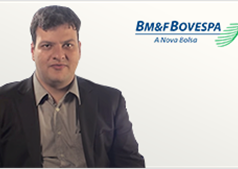 Hear Wellington Vita, Information Security Manager, explain how AlgoSec helps BM&FBOVESPA maintain a secure, compliant trading environment. 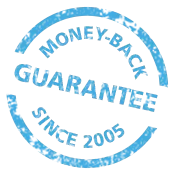 At AlgoSec we proudly say that we are obsessed with ensuring the complete satisfaction of our customers.